Over the years, clinical research has become an integral part of the American Association for Cancer Research’s meetings and journals. We asked physician-scientist Kenneth C. Anderson, MD, program director for the Jerome Lipper Multiple Myeloma Center and LeBow Institute for Myeloma Therapeutics at the Dana-Farber Cancer Institute in Boston and editor-in-chief of Clinical Cancer Research, one of the AACR’s eight journals, to share what the AACR means to him, where the organization is going, and why clinicians like him should be involved. Why are you an AACR member? I joined and have been very active in the AACR for both professional and personal reasons. It has provided an extraordinary opportunity to enhance my knowledge and collaborative studies in both basic and translational research. Progress in both areas has been expedited due to the sharing of molecular mechanisms and targeted therapeutics, as well as immune-based strategies, with my colleagues who are studying other solid tumors and hematologic malignancies. As editor-in-chief of Clinical Cancer Research, I have helped to focus the scientific and translational expertise of the AACR to benefit patients. There is no greater goal. I am grateful to have been part of the AACR’s regulatory science efforts to facilitate partnerships of basic and clinical researchers, industry, regulators, and most importantly patients, to fast forward progress to new biomarker and drug development. On a personal level, at the AACR I have developed cherished colleagues and friends committed to translational research internationally. 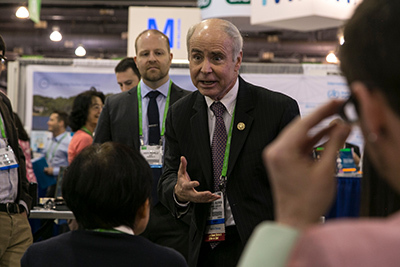 Dr. Anderson speaks with conference attendees during a Meet the Editor session at the AACR Annual Meeting 2015 in Philadelphia. How has the AACR changed during your time as a member? Why do you think that is? The AACR has continued to foster cutting-edge basic science research in cancer and related technologies. In addition, the AACR has a growing impetus to feature and promote clinical studies of novel biomarkers, as well as targeted and immune therapies. The Annual Meeting and other forums now highlight first-in-human, practice-changing clinical trials. This emphasis will assure that the world-class science presented in the AACR’s meetings and journals is translated to improve the outcome of patients with cancer. Why is the AACR relevant to clinicians? The AACR is a major source of new scientific advances in the pathogenesis of cancer, and their impact on diagnosis, prognosis, and treatment of cancer. There is a major focus on translating these advances from the bench to the bedside. Are there areas of research in the AACR’s wheelhouse that may be of particular interest to doctors working in the clinic? Advances in both precision medicine and immune-based therapies are a major focus of the AACR in multiple venues ranging from workshops where cutting-edge data is shared by world leaders, to a broad range of journals conveying these advances, and especially to the AACR Annual Meeting where major advances and strategies for future progress are featured. Why is it important for clinicians to understand basic science? Rapid advances in our fundamental understanding of the science of cancer are allowing for identification and validation of targeted and immune therapies, rational design of combination trials, patient selection for clinical trials, as well as correlative studies of patient samples to identify biomarkers of response and inform treatment strategies to overcome resistance and improve patient outcome. The AACR’s journals and meetings are where these advances are first reported and a major source of new information for both basic and clinical researchers and caregivers. The AACR is therefore a major source not only of basic scientific advances, but also their appropriate application to improve the practice of medicine in cancer, ultimately assuring that these scientific advances count to improve the lives of patients and their families.